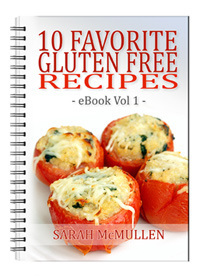 Sarah is a working mom of one who eats a gluten free diet after discovering she had an intolerance to gluten. Sarah loves to find ways to use gluten-free, natural ingredients and herbs while meeting her husband’s love for high-taste and wholesome food. She is a seasoned home-chef bringing her imagination and creativity to each recipe she creates. You have permission to offer this ebook on your own website, but we do ask for a link back to www.MeatIsNotASideDish.com. This book is not for resale.